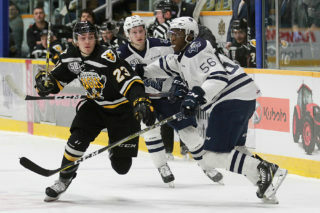 The Screaming Eagles dominated on the shot clock and the scoreboard in a 6-2 win on Sunday afternoon over the Acadie-Bathurst Titan at Centre 200. The tone was set with a trio of first period goals for the home team, including two just nine seconds apart. At the 11:10 mark Ian Smallwood snuck into the play and converted a pass from Olivier Bourret to beat Tyriq Outen. 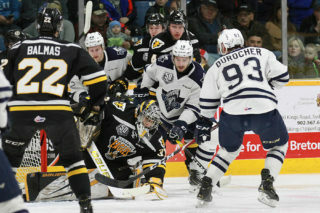 Less than ten seconds later it was Bourret on the finishing end of one timer as he zapped a shot by the Bathurst netminder after a pass from Shaun Miller. Egor Sokolov would finish the scoring in the opening period for the Screaming Eagles. The Russian forward would cash in on a rebound in front of the goal in the final two minutes of the opening frame and it would be a 3-0 scoreline after 20 minutes. Bathurst would show some pushback in the middle stanza, first getting on the board on a power play point shot from Noah Dobson. At the 13:13 mark William Champagne would tighten the game by tipping a puck out of midair, closing the gap to 3-2. But the Eagles would score twice more before period’s end to reclaim the three goal cushion. 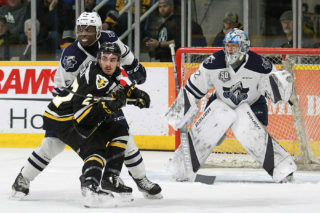 Isiah Campbell set up in front of the net on the power play and put home a rebound in the blue paint to restore a two goal margin for the home side. Just 17 seconds later, Brooklyn Kalmikov would take the puck from Keenan MacIssac and score from a similar spot on the ice. 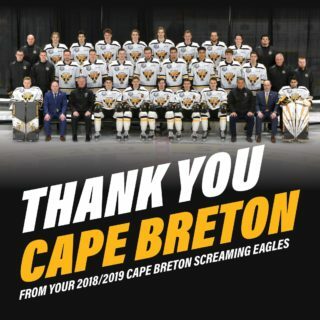 With the game back in control, the Eagles would add to the lead in the third period when Liam Kidney would bounce a puck off Outen and into the goal. 37 of 43 in the loss.